Preheat oven to 325°F with the rack in the middle position. Lightly grease a bundt pan with butter and set aside. 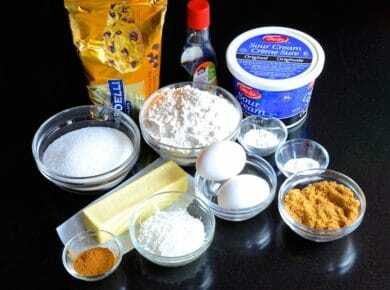 Sift together flour, baking powder and baking soda and set aside. Place all of the topping ingredients into a separate small bowl, toss together and set aside. 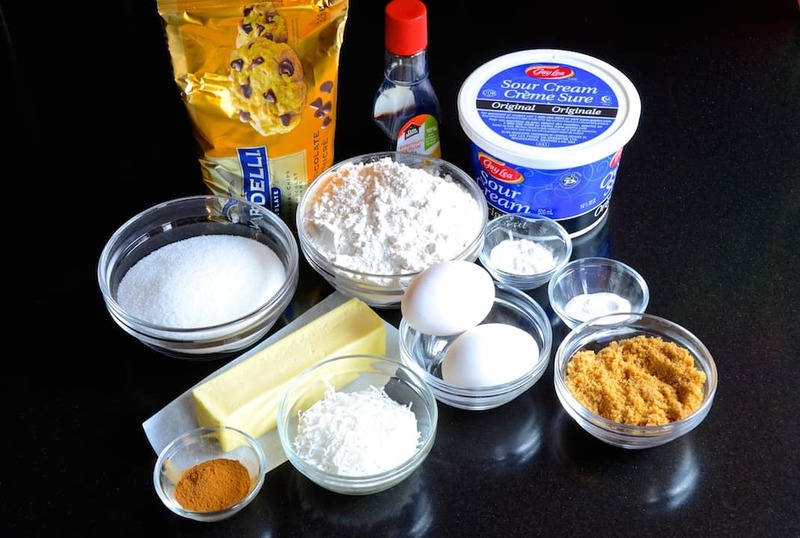 Cream butter and sugar in a medium-sized bowl using a hand mixer until light and fluffy. Add the eggs and vanilla extract and beat on medium until incorporated. Alternate adding thirds of the flour mixture and sour cream into the egg and butter mix. Combine well. 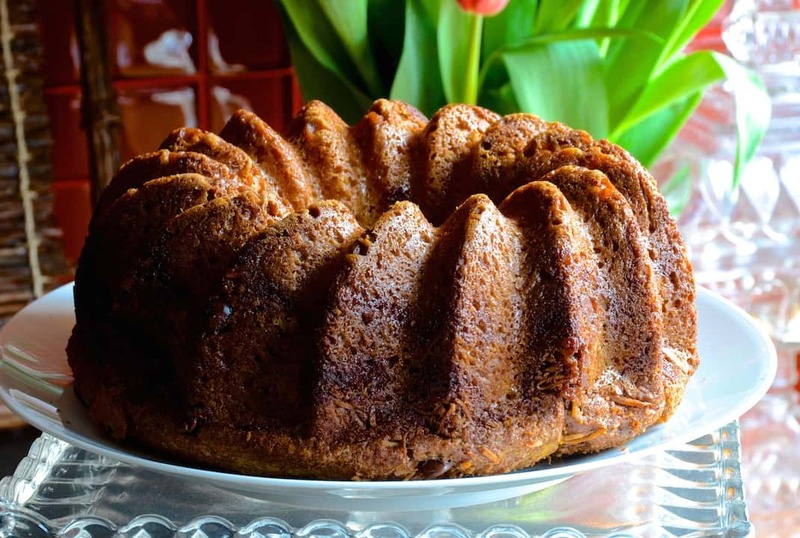 Spoon a third of the batter into the Bundt pan and use a spatula to distribute it evenly. Sprinkle with a third of the topping. repeat this process two more times, finishing with the topping. Tap the Bundt pan on the counter a few times to release any bubbles. Transfer to oven and bake for 50 minutes, or until a cake tester comes away clean. Leave cake in pan and place onto a wire rack to cool. After 15 minutes, invert the pan onto a presentation plate, and carefully release the cake. Allow to cool for at least 30 minutes before serving. 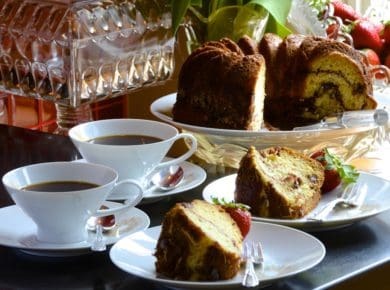 Grab a coffee and get ready to chat – this SOUR CREAM COFFEE CAKE is so fantastic, it’s the talk of the town! We’ll begin with a huge shout out to Carol’s mom, affectionately known as the one, the only, Gramma Judy. 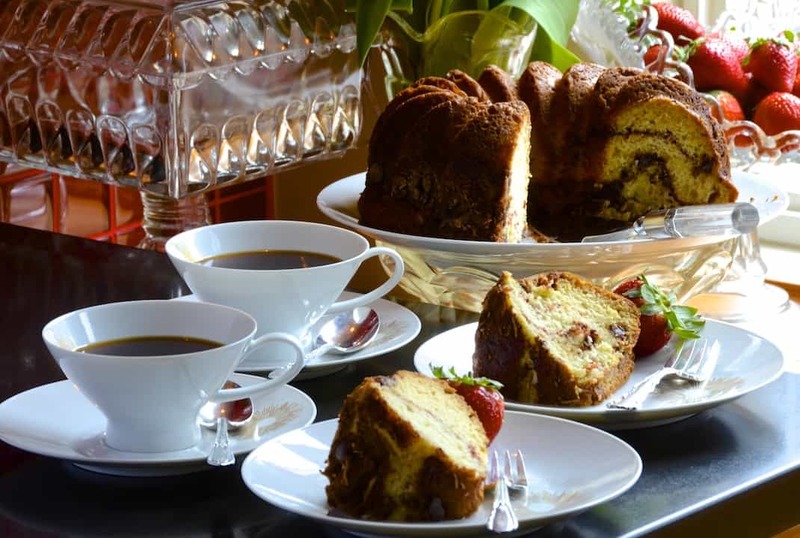 She’s shared another fabulous treat for everyone to enjoy, her SOUR CREAM COFFEE CAKE RECIPE. If you’re new to Weekend at the Cottage, don’t miss her equally tasty offering, BLUEBERRY MUFFINS. This delicious, rich cake is the perfect snack whenever friends drop by for an afternoon or after-dinner visit. If you’ve made use of coffee cake mixes in the past, we know you’ll find this much more pleasing. PIN this recipe to your favourite dessert board or bookmark the page for future reference. 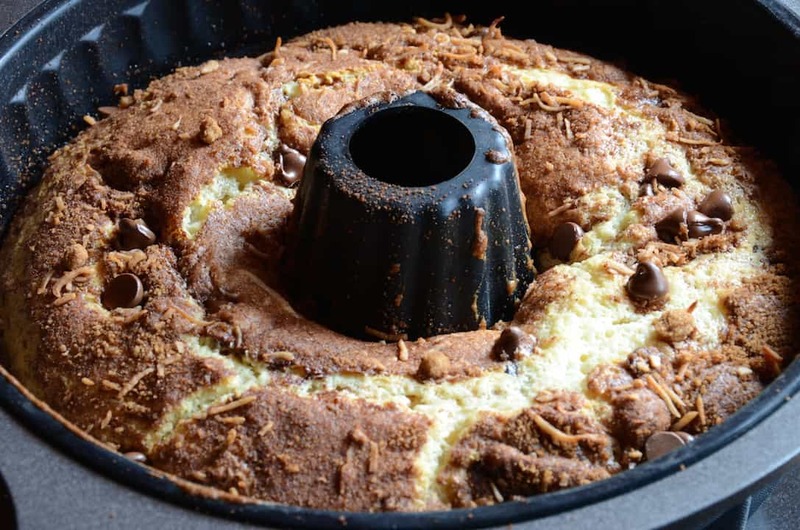 We all commented on how easy this SOUR CREAM COFFEE CAKE is to make. Follow Judy’s straightforward instructions to the letter and you’ll have stellar results. Make sure the butter and eggs are at room temperature for best results. Using soft butter ensures the sugar almost melts into it when you beat them together, and we find using room temperature eggs makes for a fluffier batter. We made the cake once just to test out the recipe, then again with a few adjustments, namely using an organic sour cream from a local dairy in Prince Edward County. Upon tasting it, we instantly understood that the recipe is all about the sour cream. Oh wait, it’s also about chocolate! 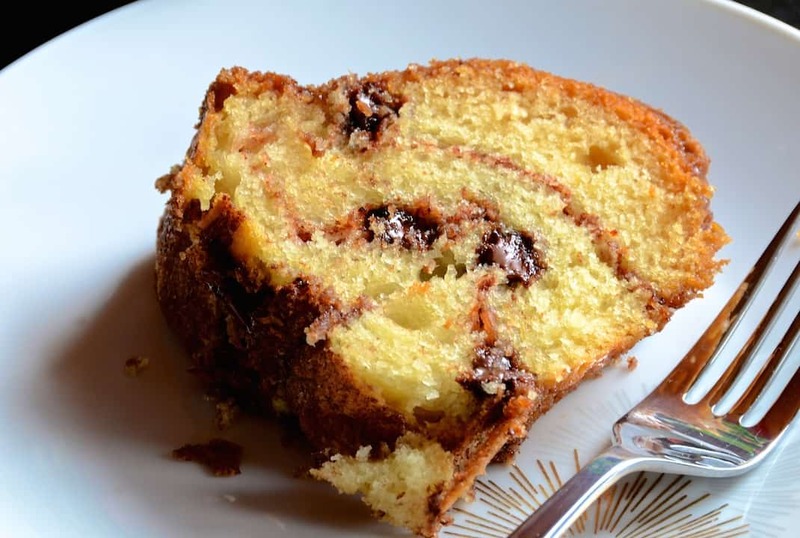 A coffee cake with chocolate needs to really deliver on that cocoa flavour. For best results, we suggest using premium quality chocolate along with the sour cream. Choosing a higher quality takes the flavour off the charts. Judy mentioned that the topping can be tweaked to accommodate people’s taste; she has made it without the coconut, with less cinnamon, and so on. On the second attempt, we doubled the quantity of topping and loved it. Like us, you will probably find yourself making this recipe again and again, it’s that good. One warning: serve smaller pieces from the get-go because everyone will ask for seconds! We got all fancy serving this cake for a coffee klatch, choosing a matching china dessert service. Doing so makes the enjoyment of it extra special. Looking for a complete dinner menu idea? We’ve got some ideas. Begin your evening with our RADICCHIO AND CITRUS SALAD. Follow with our CHICKEN PARMESAN CASSEROLE served with a side of GREEN BEANS ALMONDINE. Finish with this coffee cake as the perfect finishing touch. 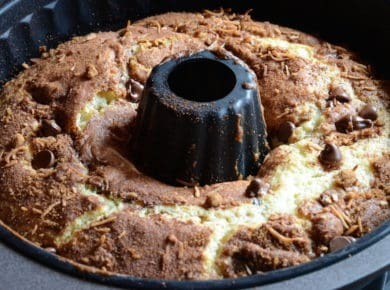 A rich and crumbly cake dotted with spiced chocolate and coconut – this SOUR CREAM COFFEE CAKE is a heavenly treat! Hi I just wanna check that coffee cake is not really with any coffee inside? Please advise.im look in GB for a great coffee cake. One that is with coffee inside. This looks great but I’m wondering if I overlooked the coffee part. Hi Nora, thanks for writing in. FOR SURE this cake DOES NOT contain any coffee. The trick is in the name – “coffee cakes” are often served as mid-morning or afternoon snacks and yes, served with a cup of coffee. Go ahead and make this luscious cake – we know you’ll love it! Cheers!